Conscious Alliance celebrates 3 million meals served nationwide with specialty lunchboxes at its 'Art That Feeds' Food Drive June 1-3. Together we are feeding people in need with a wide variety of healthy meals. Hunger relief and youth empowerment organization Conscious Alliance announces today a major achievement for all fighting hunger in the U.S.: The Boulder-based nonprofit, thanks to volunteers, music fans, natural food brands, musicians and artists all over the country, has served three million meals to hungry families and children without access to reliable food sources. To celebrate the milestone achievement, Conscious Alliance will host a specialty ‘Art That Feeds’ Food Drive on June 1 – 3 at the Bassnectar shows at 1STBANK Center in Broomfield, Colo. 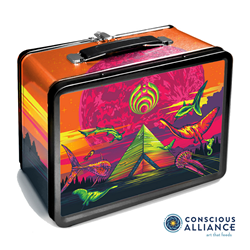 The first 150 patrons who donate 20 non-perishable food items or make a suggested monetary donation will receive a one-of-a-kind lunchbox designed by artist Charlie An AKA XLUSIV, reflective of the organization’s support of healthy food for school children on the Pine Ridge Reservation. Conscious Alliance will host more than 20 ‘Art That Feeds’ Food Drives this summer, at festivals and shows including Electric Forest, Sonic Bloom, Phish, Dead & Company, STS9 and more. Conscious Alliance served its first two million meals over 13 years of operation, hitting the milestone in December 2015. Thanks to new programs and a strong portfolio of natural food partners, the organization was able to more swiftly serve an additional one million meals in less than three years. In addition to continuing its signature food drives, Conscious Alliance added and expanded partnerships with natural and organic food companies including Organic Valley, Justin’s, Plum Organics, Jackson’s Honest, Love Grown Foods, Quinn Snacks, Angie’s Boom Chicka Pop, PROBAR and more, with a new focus on educating and encouraging brands to donate “close-to-code” product (food that is still good for consumption, but not able to be sold at retail), thus reducing food waste and accelerating the nonprofit’s ability to swiftly provide more food to those in need. Conscious Alliance continues to grow and diversify after 16 years, creating a new volunteer program in 2017 that engages high schoolers, corporate employees and others to spend a few hours assembling dried, healthy packaged soups to stock food banks. Thanks to musicians like STS9, Dave Matthews Band, Jack Johnson, The String Cheese Incident and countless others, plus talented visual artists, passionate music fans and thousands of dedicated volunteers, Conscious Alliance has hosted more than 90 ‘Art That Feeds’ Food Drives per year for the last 16 years, and continues to support over 28 food banks nationwide and on Native American reservations. On the Pine Ridge Reservation – where 49 percent of the population lives below the federal poverty line, the average lifespan is 48 years for men and 52 years for women, and there is one grocery store in a geographic area the size of Connecticut – Conscious Alliance uses food drive and brand partner donations to operate a food pantry that feeds 50 families every week, and the ‘Bring Nutrition Home’ backpack program at Loneman School, feeding all 250 students healthy, nutritious food every weekend throughout the school year. For assets, images and more information on Conscious Alliance’s 16-year impact, please view the complete Media Kit and visit Conscious Alliance on Facebook, Twitter and Instagram. Conscious Alliance, a national 501(c)(3) nonprofit organization, supports communities in crisis. Based in Boulder, Colo., Conscious Alliance operates through a three-tier approach: emergency food relief to communities across the United States; empowerment programs for youth in impoverished regions of the country; and nutrition, exercise and gardening education for youth in economically isolated Native American reservations. Conscious Alliance operates ongoing food collection and hunger awareness programs by organizing food drives at concerts and music events. The donations collected benefit local food pantries nationwide and economically isolated Native American reservations. Conscious Alliance works with myriad companies and organizations to further its mission of providing life changing and life enhancing programs to the communities they serve. For more information visit http://www.consciousalliance.org/.